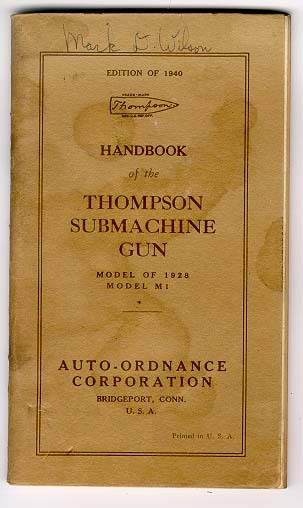 As you can see, there is a brown paper, pasted on correction to the address for Auto-Ordnance Corporation on the front cover indicating "Bridgeport, Connecticut, U.S.A." on the front cover. 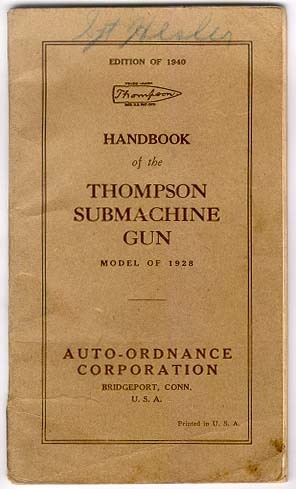 Underneath the pasted on correction, from what I can see, is the same printing as the 1936 handbook, stating, "New York, N.Y., U.S.A." and "Cable Address: "Autordco-New York." The inside title page also has the same pasted in address correction, as can be seen in the picture below. I'm curious if anyone else has ever seen one of these with the pasted on address correction, and whether they might be able to provide photo documentation of their example. I always like to obtain as much documentation as possible on paper items, and that's why I include the scans of my examples. 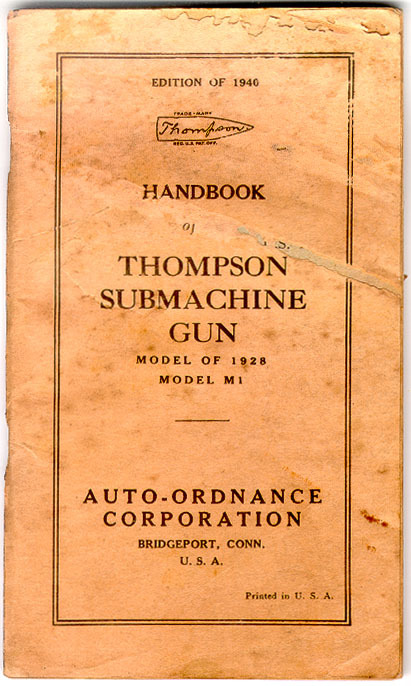 I know the Bridgeport plant was acquired in August, 1940, and production began in 1941, so I am assuming this handbook with the pasted-over address is a very early example of the 1940 handbook if the address had to be changed. Just for backup info, I am including links to some of the other 1940 catalogs I have had in stock over the years. 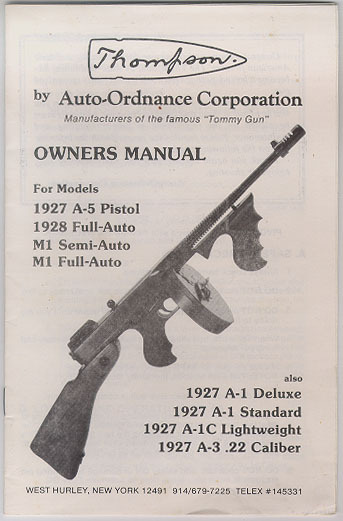 I currently have 5 in stock, and I have not scanned them all in, but the following additional 15 scans should provide some documentary evidence of the 1940 catalog in general. Here are some "Second" editions, with the overstamped "Model M1" on the cover, and the same brown colored paper cover as the first edition. Please post if you have any information regarding the pasted-over address correction example of the 1940 handbook. Yes, you have an early version of the 1940 catalogue. Here is what it would look like without the pasted-on Bridgeport, CT address. Note the New York, N.Y. address. The inside front page also has the New York address. I haven't seen one with a pasted-on address correction. I would say that's a keeper! Really neat stuff! Thanks for sharing. 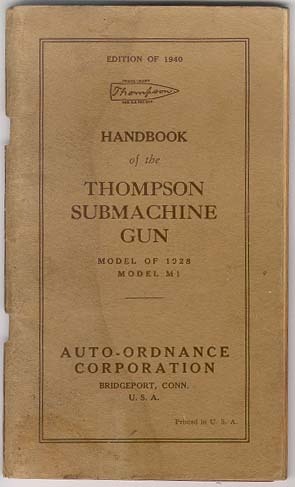 So logically.....the NY, NY is the first edition; then they make the move to Bridgeport and use a stick on address change until the old stock is used up (2nd edition); then the 3rd edition has the Bridgeport address properly printed; followed by the more common Model of 1928/ Model M1 versions. Well we are off and running - the price just went up - we now have 5 different copies to collect, bad enough Murray ID 5 variations in AO mags. That will give some something to do while attempting to collect all the different models of the Kahr drums. Good information and something to look for! This is one great board. I have the two different versions of the Model of 1928/Model M1 and noticed the difference in color but never thought about them being from a different production run. Orange tint - your right. dalbert and gijive - I have never seen either one of the two versions of the Edition of 1940 Handbook you both have posted. I don't think either version has ever been published in a reference book. If so, would you let me know in what publication. gijive, how many of what appears to be the "first" version of this handbook have you seen/owned? There may be one more version - one with a blue cover. Jim Bannan was a frequent exhibitor at the Houston AstroHall Gun Show in the late 80â€™s and early 90â€™s. 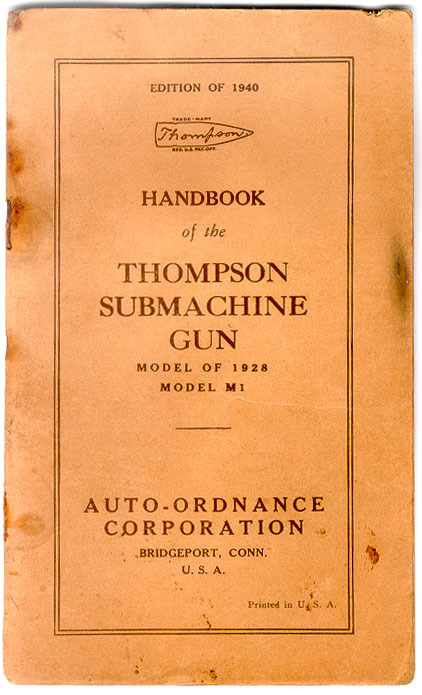 As you can imagine, he had a lot of Thompson artifacts. One Handbook he had on display was an Edition of 1940 Handbook with a blue cover. I cannot remember if it was a Model of 1928 or a Model of 1928/Model M1 edition, but I do remember the blue cover because I have been looking for one like it ever since. It seems I have seen the blue cover edition referenced somewhere or perhaps pictured somewhere, but I cannot locate the source at the moment. 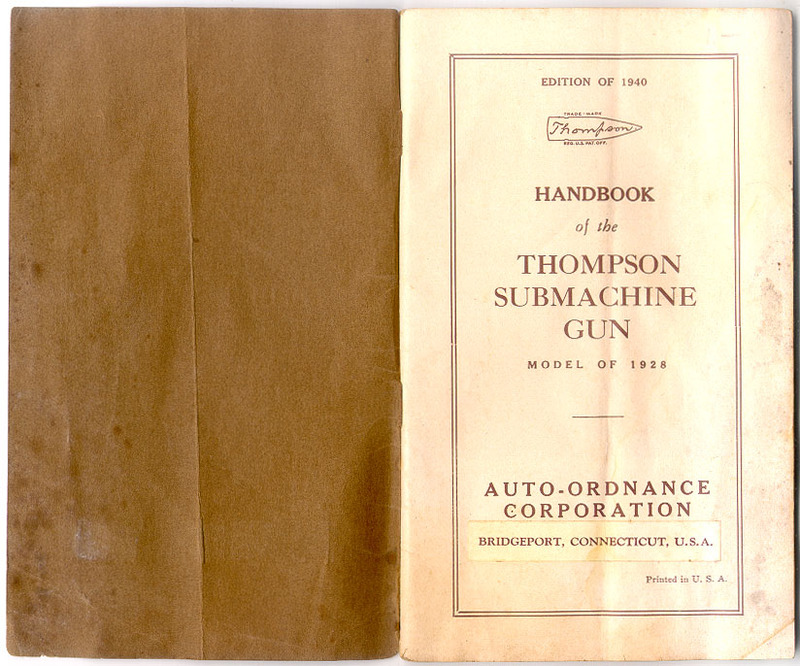 Has anyone else seen an Edition of 1940 Handbook with a blue cover. This is one great post. gijive, any chance you would want to sell your "first" edition. Thanks everyone. I don't believe either of the first editions that we have documented here have appeared in any publication. I have seen a picture of another blue covered handbook, but I was not able to determine if it was genuine. Here are 2 more pictures of the "third" 1940 edition as described in Tracie Hill's book. 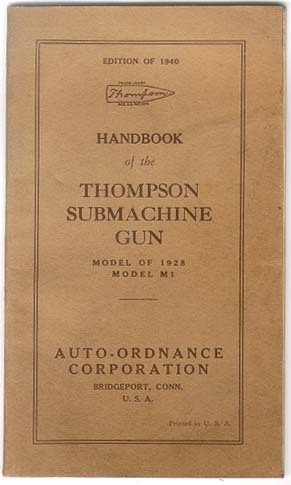 These were not printed as overstamps, as were the brown paper covered versions for the 1928/M1 "second" edition of the 1940 handbook. They have a lighter weight cover that has an orange, slightly pinkish hue to it. 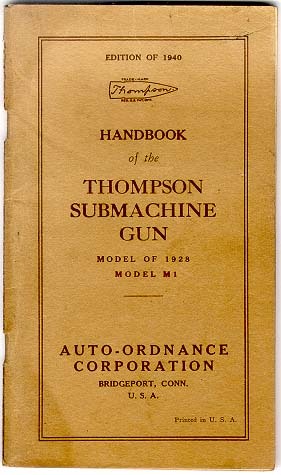 I now consider this version the "fourth" edition of the 1940 handbook. I don't like to go by memory, but it seems like a blue colored cover may have been associated with a handbook printed in a foreign language. I could be wrong. As you can see, I like to document with pictures, and I do not have a picture of the foreign blue colored handbook that I seem to recall. my copy is like gijive posted. sigh now I need another 4 versions for a complete collection! The blue cover edition you posted is very similar to the one I saw that belonged to Jim Bannan. I can't say for sure that Jim's handbook was not a reproduction. However, nothing at the time made me suspect it was a reproduction. I recall speaking to Jim about all his manuals and he never stated any of them were reproductions. I bet someone will have the answer to this riddle. If you haven't spoken to Tracie about the 1936 Catalog issues, this may be another area to inquire about. 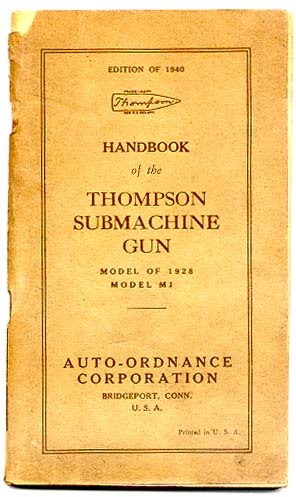 I'm no expert on Thompson literature, but that blue-cover edition is indeed a reproduction, and a "low budget" one at that. Notice the printing - the ragged edges and swollen distorted lettering are indicative of an overexposed negative and/or printing plate, which was probably used on a low-end offset machine (e.g. single transfer roller single blade) with paper not well suited to the offset process. 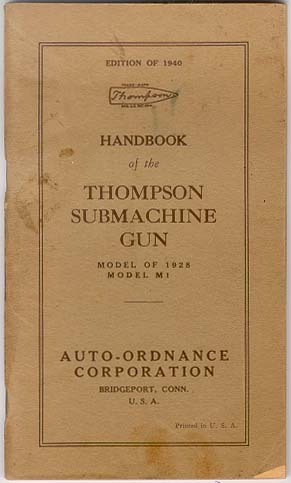 Note especially the fine printing surrounding the Thompson logo - individual letters are filled in and hardly readable. By contrast, the originals (and good reproductions) have lettering that is sharp, crisp and open (no swollen lines crowding into the "white" areas of the letters). The originals were probably typeset, with cuts for the graphic inserts. Offset isn't ruled out, but either way the originals were made by professional printers who knew what they were doing. The blue cover edition obviously was not. Edited by Bob B, 25 January 2005 - 12:26 AM. gijive, how many of what appears to be the "first" version of this handbook have you seen/owned? Actually, I haven't personally seen any other versions of the book with a New York address. I didn't mean to mislead, I just meant I hadn't seen any others with a pasted-on Bridgeport, CT address. I have only seen the version with the printed Bridgeport address. I appreciate your interest in purchasing the handbook I have, but I think I'll keep it. If I ever decide to part with it, I'll notify the members of this Board first. It's interesting to see the various editions of this handbook that were published. I find the version that Dave pictured, with modified address, a particularly interesting specimen. gijive - I too find Dave's Handbook a very interesting item. And yours is in the same category. I have looked at many Edition of 1940 Handbooks over the years and have never seen the ones you and Dave have. I cannot believe there are too many of them in existence. These are great Thompson artifacts. Bob B - I agree completely that the blue cover Handbook posted by Dave is a reproduction...and a poor one at that. The Handbook with a blue cover Jim Bannan had looked pretty good to me. Question to all: Does anyone have (or have possibly seen) one of the reproduction blue cover Edition of 1940 Handbooks like Dave has posted? I have never seen this reproduction in the market place. 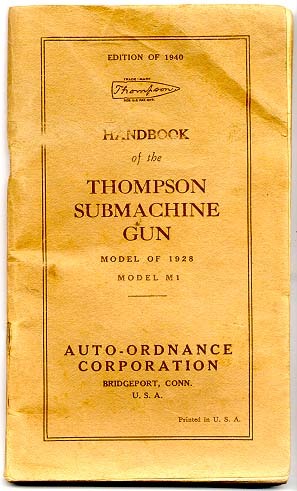 As a sidenote, and kind of a comical one, I just received another Auto-Ordnance manual with a pasted over address in stock. 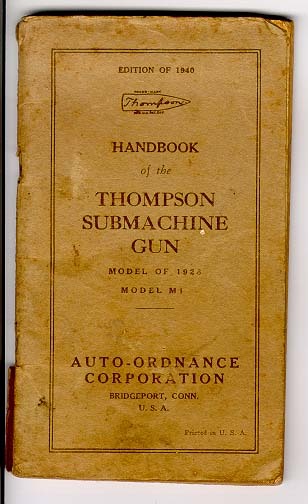 It seems that Kahr Arms is using (or used) some old stock of West Hurley Thompson full auto/semi-auto manuals, and covered up the old West Hurley address with their Blauvelt, NY address. 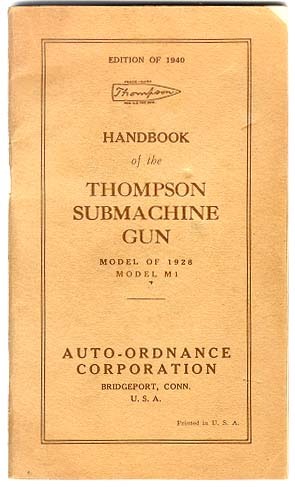 Maybe I'm on the cutting edge of this possibly rare variation of the Auto-Ordnance West Hurley manual!! Note the new address sticker at the bottom of the cover page. The address on the back is also covered. 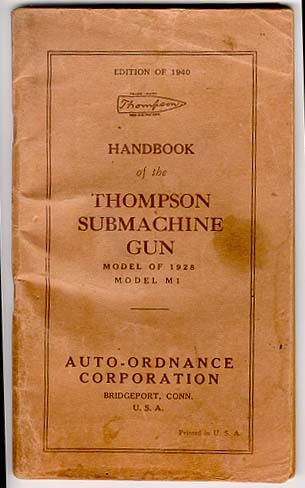 Just for comparison, here is the original WH Thompson manual I received with my WH M1 NIB in 1988. I have one of the blue cover copies. It looks appropriately worn to be original and has the correct green insert pages. However, it is definitely a reprint since the pictures have all of the charateristics of copied images. I am comparing it to an original tan cover 1940 28/M1 manual, and the pictures in the original are much sharper, with much more detail and do not exhibit the telltale image fringe of a a cut-and-paste. 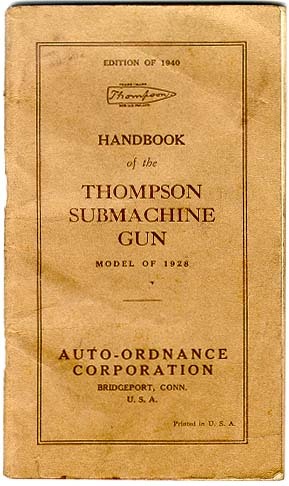 The blue handbook I have pictured in a previous post that is a reprint has the green pages also. (very bright green pages) It has the copied image characteristics. Yours may be from the same batch of reprints that mine came from. Thanks Roger. This reprint blue cover edition handbook must not have had a very large printing. Only two reported on the board thus far. Perhaps more will surface in time. Speaking of reprints, does anyone have one of the miniature Edition of 1940 Handbooks (Model of 1928)? It measures approximately 2" x 31/2". I have only seen a few of these over the years. 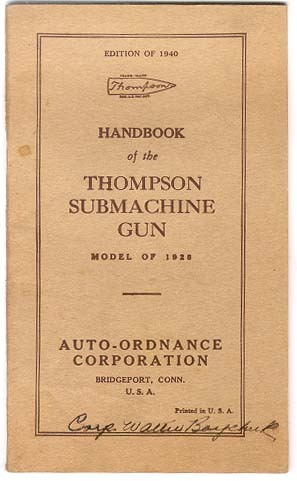 As a note of interest to folks on this board, the 1940 Auto-Ordnance Thompson SMG Handbook was mentioned in the 1940 Marine's Handbook as a reference item for Marines. 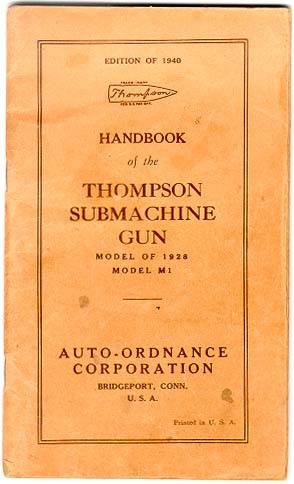 The chapter in the Marine's Handbook on the Thompson probably refers to the Model of 1928 Navy Overstamp TSMG. 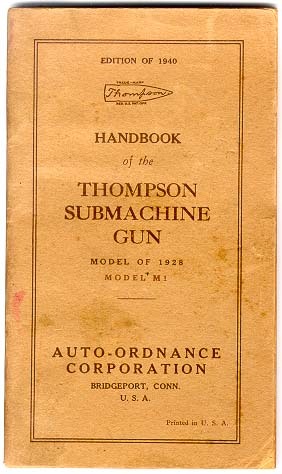 If my research is correct, the Marines only had about 700 Thompsons in inventory at the time the 1940 Marine's Handbook was published. (Please correct me if I'm wrong on this point.) 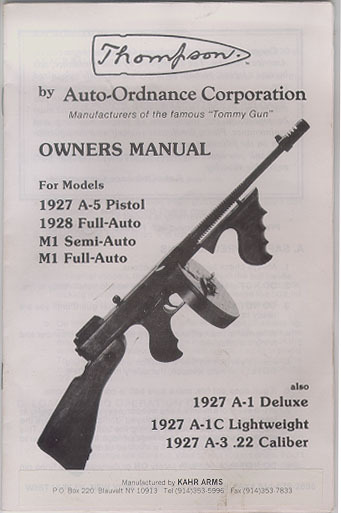 There is a very good indoctrination to the 1928 Thompson in a Q&A format in the handbook, and I have converted it to an Adobe pdf file that can be downloaded at the link below. It is a 12 page document, and is 12 Meg in size. I will keep the link up for a week or so. If you miss the download after I have taken it down, just send me an e-mail, and I can provide an alternate link. Maybe some folks haven't seen this reference, so I hope it will provide some good reading material and history. 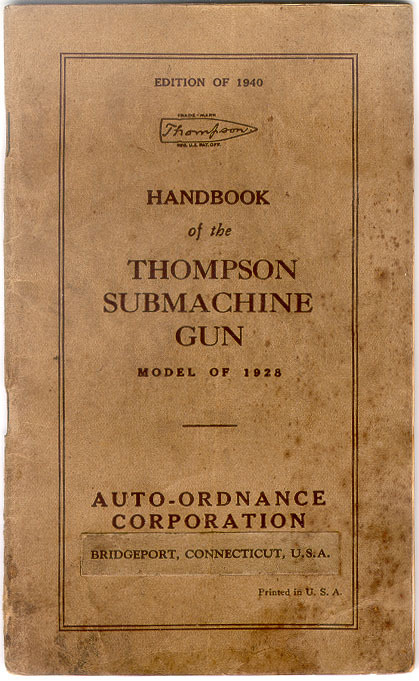 By the way, if anyone on this board is ever looking for a particular military firearm manual or rare firearm book, please e-mail me. I have over 500 in stock currently. 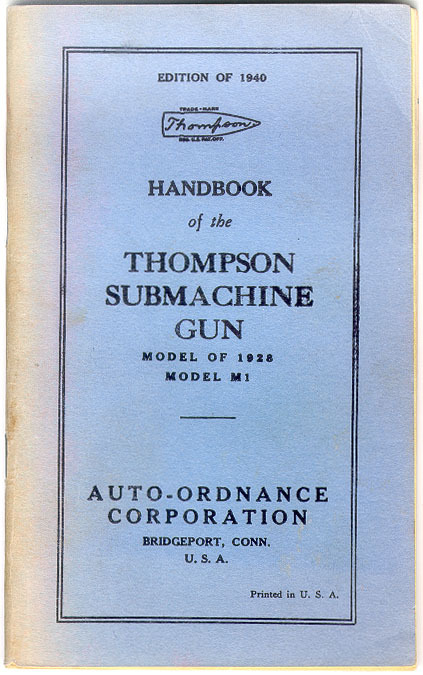 I just got another blue 1940 Thompson Handbook in stock today, and it looks like a reproduction similar to my other blue repro manual I pictured in a previous post. They appear to be printed with almost exactly the same paper and style, but this one demonstrates a higher quality of cover printing. I bought it thinking it was probably a repro, but also thinking it might be a yet undocumented original. As we discussed before, there seems to be some knowledge of a blue one existing. I am beginning to think all blue ones are reprints, but please prove me wrong if you can. 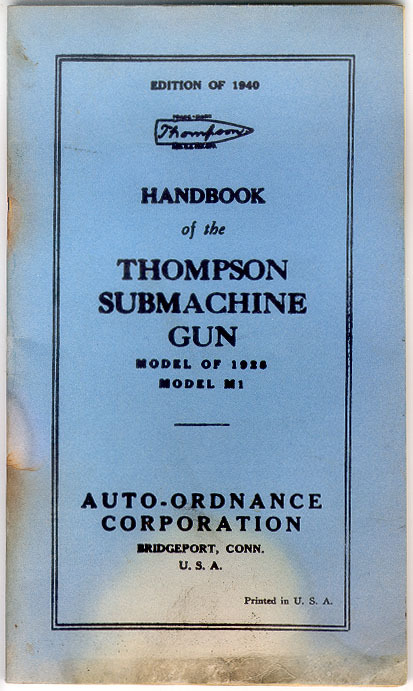 Once again, if anyone has evidence to an original blue 1940 handbook, I am most interested in documenting it.